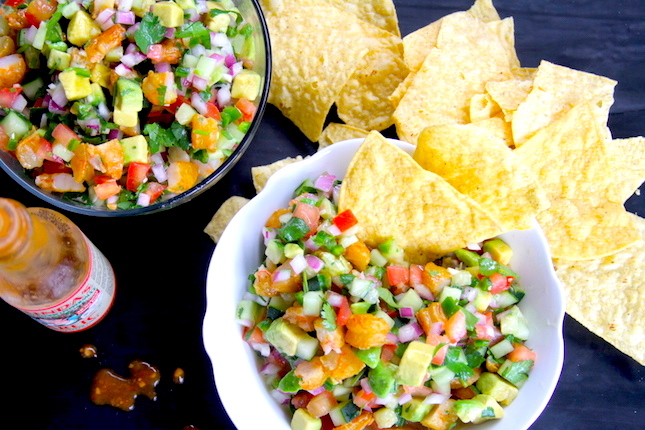 Traditional ceviche consists of raw seafood that is cured, or chemically cooked, in an acid. Of course, we like to put smoke on whatever we can get our hands on, so we’re giving our shrimp a smoke bath before it hits the citrus juices. In this recipe, when the shrimp comes off the smoker they will be fully cooked before being marinated in the acid, so the soaking time won’t be as long as if we were starting with raw shrimp. You could do the same with a cold smoke and longer marination. This method will also ease the minds of your friends who are wary of seafood that’s not cooked over a flame. 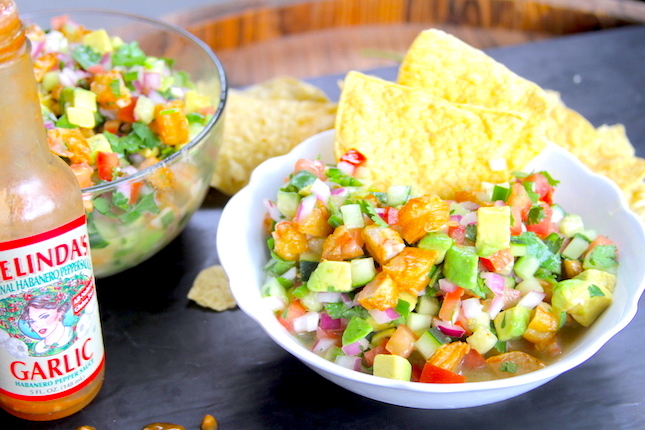 You can think of ceviche as a seafood salsa, if you like. The ingredient possibilities are endless, so do some experimenting with different seafood, veggies and fruits. Step 1: Preheat your Yoder Smokers YS640 to 200ºF. Line the second shelf with a FrogMat, season the shrimp with Chili Dawg’s Green Chile Seasoning and place them on the FrogMat. 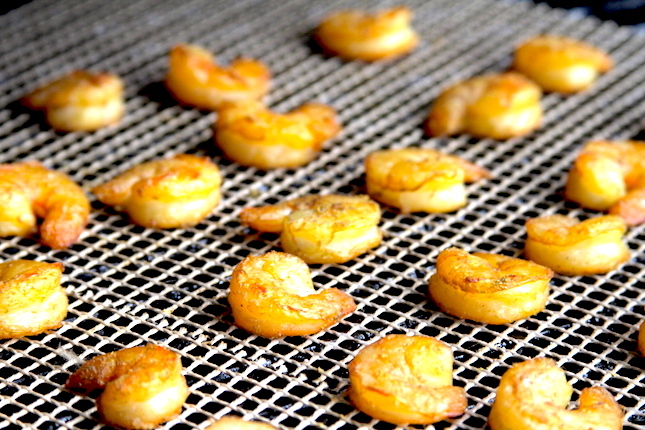 Smoke until the shrimp reach an internal temperature of 140ºF. Remove the shrimp from the cooker and give them a rough chop. Step 2: Combine the orange, lemon and lime juices in a zip top bag. Add the shrimp, onion, cucumber, tomato, jalapeño and garlic to the bag. Marinate for 2 hours in the refrigerator. Step 3: Remove all ingredients from the bag. Strain off and discard most of the liquid. 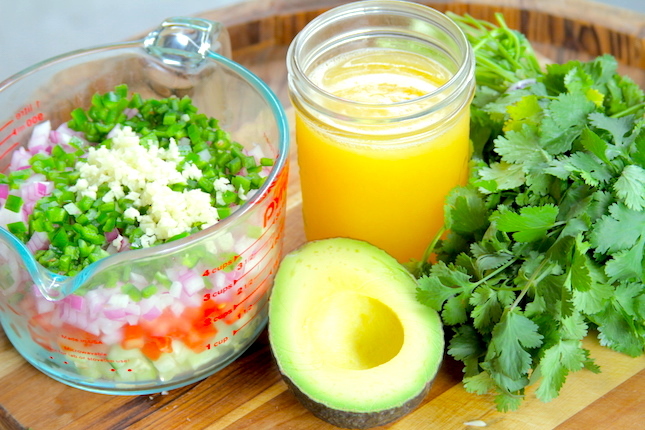 Add the avocado and cilantro to the other ingredients. Toss to combine. Serve with tortilla chips and your favorite hot sauce.